The Making of Mrs. Hale (2018) by Carolyn Miller is the final novel in her Regency Brides: A Promise of Hope series. This book comes in all forms including eBook, and is 336 pages in length. With a full-time job and a very busy six-year old at home, this novel took me four days to read. I received a copy of this book in paperback form from the author via her publisher, Kregel Publications. I also purchased an eBook copy of this book from Amazon on December 10, 2018 to review. In no way has this influenced my opinion of the story. All opinions expressed in this review are my own. I give The Making of Mrs. Hale 5 STARS. This novel is a Regency-era Christian Romance set in England. Julia Hale ran off to be married in Gretna Green, following romance instead of common sense. But her tale isn’t turning into a happily ever after. Her new husband is gone and she doesn’t know where–or if he’s ever coming back. Julia has no option but to head home to the family she betrayed by eloping and to hope they’ll forgive her. Especially now that she might be carrying a baby from her brief marriage. Carolyn Miller cannot write a bad story if she tried. I have enjoyed and loved every book she has written so far, and The Making of Mrs. Hale is one of my top favorites. The plot line is highly engaging, the characters are beautifully crafted, but it is the themes that Mrs. Miller discusses in her novel that really set Mrs. Hale apart. Carolyn begins this story with her main characters already married. The reader never really gets to see Thomas and Julia court. Instead, we readers are shown about 18 months into their marriage and things appear awful. When Julia is forced to return home without her husband she is destitute, sick, and broken. One of the very first things her immediate circle of family and friends relates to her is that she needs to divorce her husband and leave him behind. Thomas has NEVER fit their ideal as a good match, so to Julia’s family and friends he should be something Julia can get rid of easily like garbage. But, Julia loves her husband. She doesn’t understand him or what path he is on, but she loves him. Why can’t people accept her choice? Why must there be so much harsh judgement? Why does she have to leave him just because things are rough right now? And, why would people counsel her this way? Ten years ago, I was with a group of teacher friends at a conference. We were out for dinner and the man who would be my husband was our server. As my best friend, Lara, tells it, sparks were immediate. At one point in the night, I announced to my friends that I had met my future husband. Of course, they all chuckled thinking I was enamored with a handsome man, but I knew. The thing is though NO ONE in my family was impressed. They actually tried many times to break me and Robert up. My mom was not OK with me being with a mere server, and thought he was out to get all my money — funny thing though, I don’t have any money to get! My brothers hated Robert and said mean things about him almost every chance they could find. And my dad, weeks before I got married, counseled me against marrying Robert because he was worried Robert would steal my retirement. Once I explained that Robert would have to be with me for 32 years before we would ever see my retirement, my dad backed down and finally approved my marriage. My family’s distrust and dislike of the man I had chosen to be my life partner broke my heart. I never once had the feeling that Robert was there to steal from me or take advantage of me. I knew he was the man God chose for me! Who cares about his job? He has a job, it makes him happy, and he makes decent money. Isn’t that enough? In actuality, my heart broke by my family’s insensitivity, their assuming I wasn’t good enough for a man for any other purpose than to be taken advantage of, and their meanness. It made me realize that my family did not respect me one iota, and that hurt deeply. In this sense, I 1000% relate to how Julia feels throughout this entire novel. The first two years of my marriage were ROUGH. About five seconds after we said, “I Do,” our life took drastic turns for the worse. I’m talking BIG, SCARY things. I was counseled several times to divorce my husband. But, I refused. I didn’t say my vows on October 23, 2011 to pay lip service to God, my husband, or to our family and friends present that day. I said my vows because I meant them. Robert and I made a covenant with God and I am not about to leave just because things get hard. In our world today where jumping ship at the slightest sign of trial or suffering is normal, it is refreshing to read a story where a heroine and her hero refuse to give up on one another when the world yells at them to do so. I absolutely respect Julia’s character for honoring God and her husband by sticking it out, by finding out the truth before she made assumptions, and by remaining firm even when things felt so unstable. I applaud Julia’s ability to follow God, to forgive her husband and herself, and to ignore the screaming of the world around her. And, I applaud Carolyn Miller for writing a novel that is not afraid to profess this important message to today’s modern readers. Thomas’s journey in The Making of Mrs. Hale reminded me of Joseph’s falls and risings in the Bible. Like Joseph, Thomas falls and rises twice. In Genesis, Joseph is thrown into a pit (fall #1) and later sold into slavery by his brothers. In The Making of Mrs. Hale, Thomas is thrown into a pit — a literal jail cell — and betrayed by men he believed were close to him. Like Joseph, Thomas does get out of this pit, but it is more like he pulls himself out of the pit. He “earns” his way out of the pit by doing what he (Thomas) thinks is best. I have always imagined that the young Joseph “earned” his way into Potiphar’s house by acting impressive, but I’ve always seen this time in Joseph’s life as being one sided and not really getting God’s purpose for him. Thomas, too, tried to do things on his own terms. Eventually, both men end up back in a pit: Joseph goes to jail for a crime he did not commit (fall #2), and Thomas reaches the bottom of the barrel because of the evil machinations of men. It is in their second pits that both Joseph and Thomas realize that only God can truly pull someone from despair. If we don’t repent and reconcile to God, we will always end up in some kind of pit that we’ll never fully get out of. Only by walking WITH God can we ever find the way out of darkness and onto His chosen path. I really love this juxtaposition of Thomas to Joseph that Mrs. Miller uses in order to remind her readers that without God we are living pitiful lives! The Making of Mrs. Hale is an excellent story. I loved every minute I spent with Julia and Thomas, and appreciate how much I connected with this couple as a couple. I very much recommend this wonderful novel. 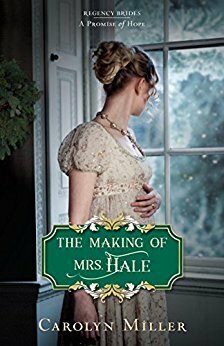 If you are looking for a well written, highly engaging, thoughtful Regency-era story, then you must purchase a copy of The Making of Mrs. Hale immediately! Great review. I’m glad you comitted to Robert and didn’t listen to naysayers! I have loved everything by Carolyn Miller. Waiting for the next one! Your reviews are always so informative. Thank you for sharing! If I hadn’t already read it, your review would make me want to pick it up. I can certainly see why you connected with the story. Aw! Thank you for the compliment! You made my day. You will enjoy it for sure, Trisha!